What’s Strong, Sustainable, and Headed to a Museum Near You? Bamboo! Two exhibitions on either coast feature community-built structures made with the trendy superwood. Bamboo has become a darling of the sustainable design world for its sturdy, fast-growing timber that can be found everywhere from cutting boards to hardwood floors. Who knew it had such an artsy side, too? This summer the flexible poles are popping up in two major museum installations on either coast. 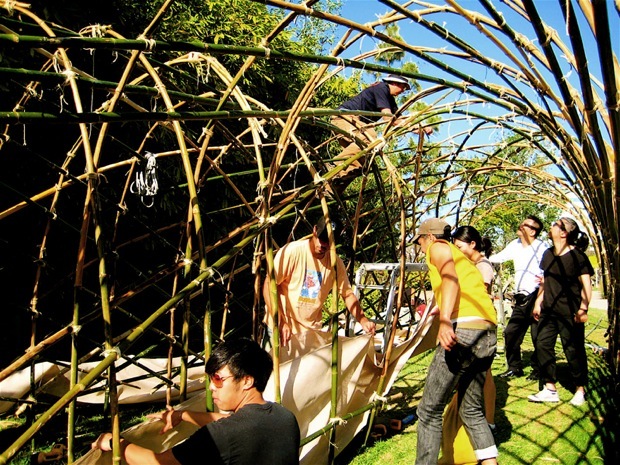 At LACMA in Los Angeles, a large bamboo structure has taken shape on the museum’s campus as part of the show EATLACMA, a year-long exploration of food, culture, and politics curated by the foraging collective Fallen Fruit. The installation, named “Promiscuous Production: Breeding is Bittersweet,” is a cooperation between the National Bitter Melon Council (you never knew that there was one, did you?) and Materials & Applications, a research and exhibition center known for its groundbreaking architectural installations. will cross-pollinate, resulting in a bittersweet melon. All the melons have to do now is go forth and bear fruit. 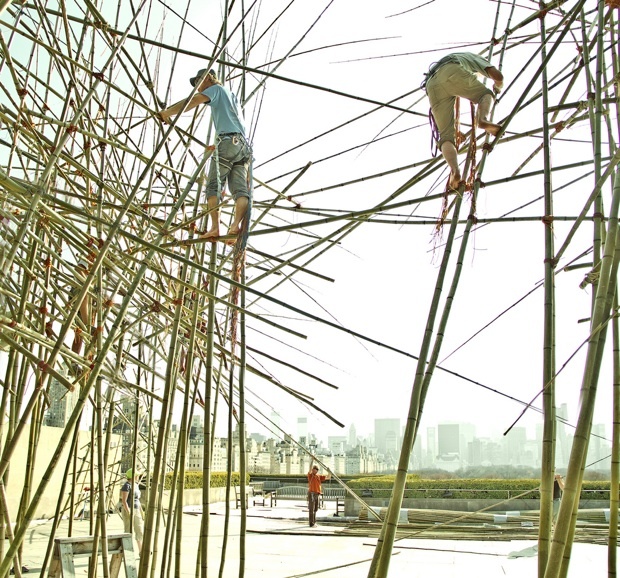 Over on the East Coast, artist brothers Doug + Mike Starn have installed a version of their ongoing experiment Big Bambú on the roof of the Metropolitan Museum of Art. This new work, named Big Bambú: You Can’t, You Don’t, and You Won’t Stop, will eventually achieve dimensions of 100 feet by 50 feet by 50 feet as it’s built out over the summer months. It’s already achieved its 100-foot width, now there’s nowhere to go but up. 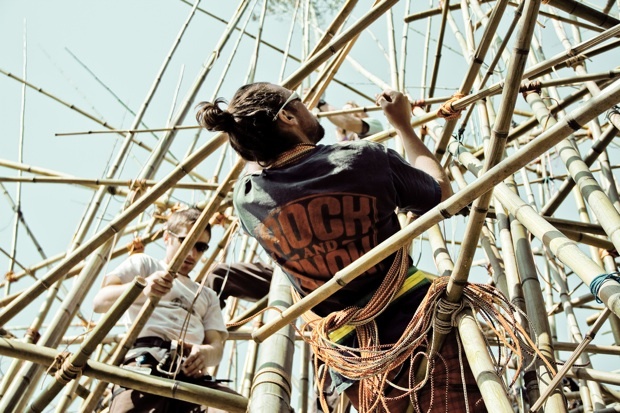 The Starns, who are primarily painters, have corralled a group of artists and rock climbers to lash together over 5,000 bamboo poles with 50 miles of nylon rope. In addition to making the piece sturdy enough to climb, the collaborators had to incorporate scaffolding-like walkways in order to move easily throughout the structure. Small tours are lead through the these pathways that float at least 20 feet over the museum, rewarding visitors with stunning views of Central Park, and of course, the ability to say you strolled through a bamboo forest in Manhattan.